Richard loves nothing more than to work on a project with the sound of smooth jazz in the background. He even finds it relaxing and quite therapeutic. And sometimes he's found working after hours to complete a job whilst enjoying a glass of his favorite red wine, Shiraz. restores cane and wicker furniture with a passion. Attention to detail and an eye for good craftsmanship is something he pursues with every new project. His favorite pieces to restore are wicker doll's prams, especially the well known Eclipse brand. Your family heirloom will be lovingly restored to near original condition using traditional methods of craftsmanship. Richard has well over 30 years experience fulfilling a passion which started as a hobby and soon became a vocation. 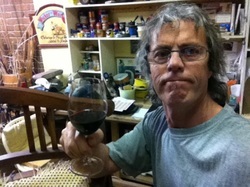 He is the only experienced craftsman in South Australia restoring cane and wicker furniture. You can be confident that your special piece of furniture with its sentimental value will be in good hands. For All You Timber Furniture Repairs & Restoration (not cane). Adelaide Furniture Doctor - Chris Sorensen.